Find some much-deserved rest and relaxation on a special getaway. The R & R retreat features a variety of workshops and activities you can choose from to create a getaway that’s all your own. And if space and time are all you need, you can simply nestle into the silence of the mountains. We’re thrilled to be launching this new program, so for the month of March, there is no additional cost to participate in the R & R activities! In this creative getaway, you are free to structure your time as you need. R and R programming includes a variety of options designed to enhance your life. You can join a journey through the labyrinth; dive into yoga; explore your meditative side and take home a few ways to calm your mind. Or learn more about nutrition and the ancient Ayurveda approach to vibrant health. You can even complement your program with a therapeutic session at the spa. 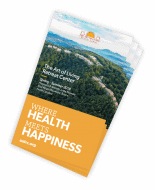 The R and R program lets you sample many of the offerings of the center and its experienced teachers to get some true R & R.
Programming features a variety of teachers in the fields of meditation, yoga, healing arts, ancient wisdom and the creative arts. Expand or restart your fitness routine with personally guided classes and nature walks with an onsite fitness expert. Learn about preparing dishes that are both healthy and tasty in this interactive, live cooking demo. In this session, you’ll look at ingredient selection, nutrition and preparation methods as well as cultivating a mindful approach to cooking and dining. Discover the ancient practice of meditative chant and have fun, whether you’re experienced at chanting or if it’s your first time. One of the oldest systems of healing in the world, Ayurveda teaches practical tips to balance mind and body throughout the changing seasons of life. Get your hands dirty in all the best ways in this fun, exploratory pottery class. You can choose between hand-building and throwing on the wheel. No experience is required. Stretch, expand and come back to center with a variety of yoga offerings tailored at a soulful, integrated approach to yoga. *The exact list of activities is subject to change based on your dates.